Kazimir Malevich is one of the founders of abstract art. Initially an adept of impressionism, he evolved gradually to a style that became more and more abstract, until the only thing he kept was a black square. His evolution is similar (but yet different) to the evolution in the work of Piet Mondriaan. The painting that was the inspiration for Ravevich (ode to Raveel and Malevich), dates from 1915, the top era of Suprematism. 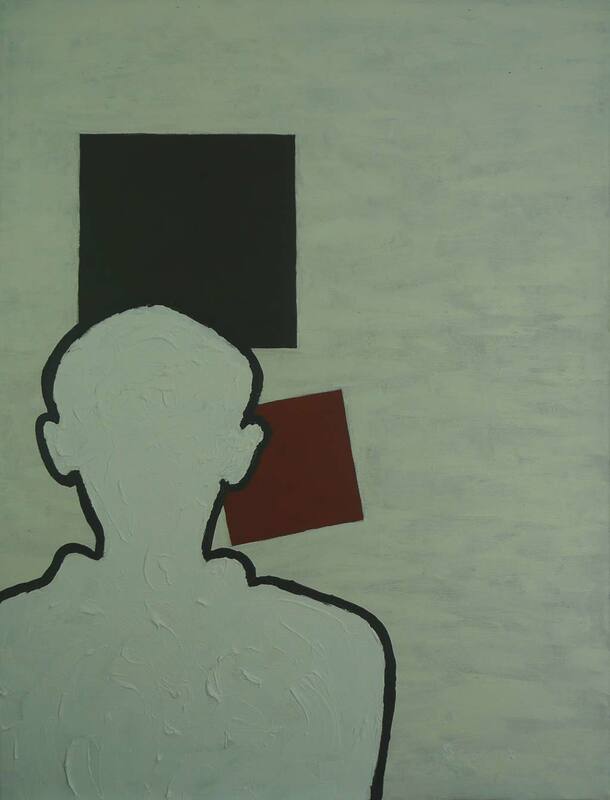 The canvas consists of nothing but a black square and a red rotated square in a sea of white. Boss uses this as the background of the Raveel-silhouette. This way the artist accentuates in a subtle way the touch points between both masters (emptiness, large color fields, peace…) as well as the differences (figuration versus abstraction, jagged contours versus austere surfaces, thick impasto paint strokes versus thin layered with underpainting). The style of Malevich is called suprematism, while Raveel introduced the new vision. You could say that Suprematism” meets “New Vision” in one painting. Tagged acrylic, boss, malevich, mondriaan, painting, raveel. Bookmark the permalink. Boss | Art | Powered by Mantra & WordPress.